Jeff Schoenau — CropSphere | Sessions on market outlook, research, agronomy. 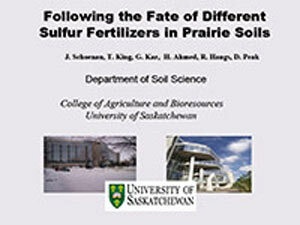 Jeff was born in Saskatchewan and completed his undergraduate and graduate degrees in the College of Agriculture at the University of Saskatchewan. His research, teaching, and extension activities deal with soil fertility and fertilizer management, conservation, and nutrient dynamics. He owns and operates a grain farm with his wife Lynne near Central Butte in south-central Saskatchewan.